Formula 3 Personalised Protein Powder is a rich source of soy and whey protein, which can help you feel fuller for longer and can help build muscle mass as part of a fitness programme. Formula 3 is an easy way to personalise your protein intake to suit your weight management or fitness needs. Contributes to better bone health. Unhealthy snacking in-between meals is often what ruins weight management programmes. Foods rich in protein can help reduce this temptation because protein promotes a feeling of fullness. Diets high in protein are also essential for those active in sport and fitness as protein builds lean muscle mass and aids muscle recovery, minimising post-exercise muscle fatigue. 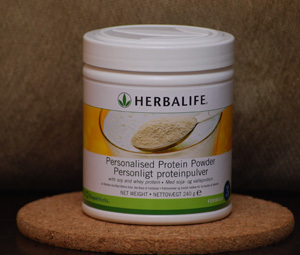 One level tablespoon of powder (6g) supplies 5g of protein. Take one to four servings daily.